As a consumer, you’ll always want the best value for money and for many people, you’ll also be looking to spend less whenever you can. When it comes to any decision in the home improvement field, you’re struck with many choices that need to be made. With an ever-increasing variety of materials, styles and products, how do you ensure you’re being smart with your wallet? If you’re looking for a door, there are two materials you might be considering, composite and uPVC, but which one will set you back more? Is the pricier one worth the extra money? A composite door is made up of several different materials, the materials themselves depend on the manufacturer but the doors are usually made up of a combination of things like steel, glass, GRP (Glass Reinforced Plastic) usually with a uPVC frame. uPVC is short for unplasticized polyvinyl chloride, which might not mean anything to you when it’s put into those terms. Essentially, it’s a flexible, lightweight plastic. 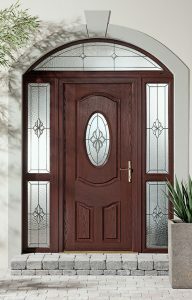 A good quality uPVC door will normally have reinforced panels made with a wood and insulated plastic in-fil panel. What are the differences between composite and uPVC? The materials they’re made from aren’t the only difference between composite and uPVC doors. The general consensus is that composite doors look better than uPVC doors as they allow for more freedom when it comes to customisation. Compatible with more colours and finishes, composite doors can wildly vary in their appearance whereas uPVC is a lot more limited. Not only that, the overall thickness of the composite door is deeper than a uPVC panel. A composite door comes in either 44mm or 70mm double rebate slab, whilst the uPVC panel is 28mm thick. 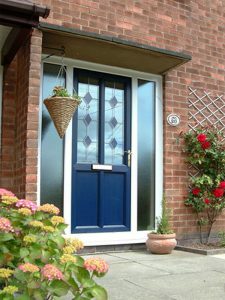 Does a composite door cost more than a uPVC door? As you might be able to guess from the list of benefits, a composite door will indeed set you back more than a uPVC door would. This is because it’s a more future-proof investment and does everything a uPVC door does to a higher standard. Composite doors are remarkably effective at keeping heat within your home and their tough materials make it so your door is exceedingly secure and robust. Despite a composite door costing more upfront, you may find yourself actually saving money further down the line. For instance, when it comes to paying money for maintenance and paying the energy bill, it’s undeniable that you’re saving money compared to a uPVC door. They’re both viable choices and if you’re in need of a door but lack the sufficient funds for a composite option, you can’t go wrong with uPVC as it will still fit your needs, just not to the standards of a composite door. No matter what it is you decide on, both our composite and uPVC doors are provided at fair and affordable prices. We don’t just offer doors though, we also sell windows, home extensions and fascias. All our products are made to the highest quality, for more information, contact us or browse our website.